Hang some stockings: Even if you only hang one or two, these babies say Christmas without a doubt. Dim the lights and light some candles: Lit candles give the same twinkle effect as strung lights, and they take a fraction of the time to set up. Throw a holiday tablecloth or table runner on the dining room table: This simple touch adds instant holiday cheer. Put on some Christmas music: Although music isn’t decorating per se, a little “Jingle Bells” is all you need to create a festive mood. Pick up a few poinsettias: Placing a few of these beauties around your home may become one of your favorite fast decorating tricks. Growers seem to introduce new colors each year, ranging from plum to pink to cream and even peach. Poinsettias work well around doorways and staircases, under windowsills, and in corners of rooms where you need a little color. They also dress up your holiday buffets. If you do decide to put them on tables with food, just make sure that you remove any wilted leaves or petals so that they don’t fall into food items. Poinsettias can be poisonous. 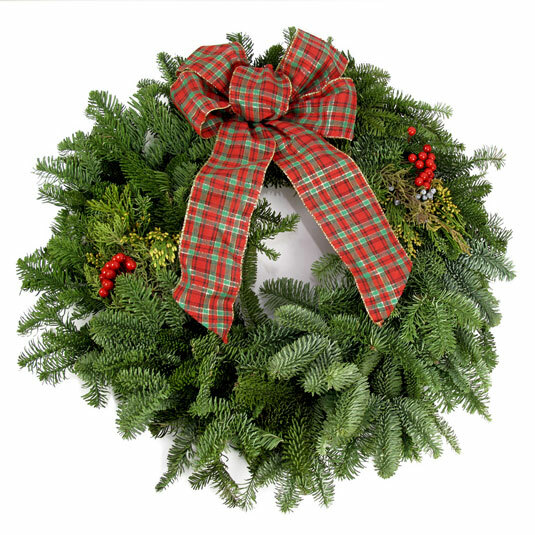 Pick up a few pine bough branches and some garland: These items dress up your home in no time. Couple them with a few premade bows and you’re ready to start slinging pine needles everywhere. Here are a few ideas for using these evergreen decorations. 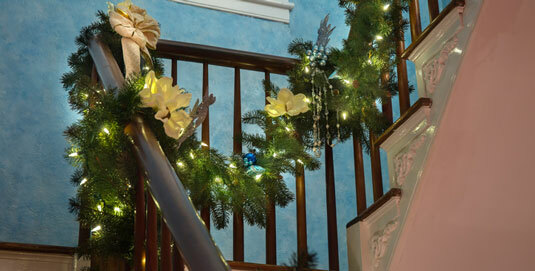 Use garland to swag or wrap around staircase banisters: Add bows where the greenery meets the handrails, and you have no-fuss decorating in a flash. Remove everything from your fireplace mantel and place a long piece of garland on it, letting it drape down both sides of the fireplace: Don’t have a fireplace? This trick works for tops of bookcases or shelves, too! Wire in a few ornaments, attach cascading oversized bows to the draped edges, and reassemble your fireplace mantel decorations, moving the garland in and out of your décor. Place a few tall candlesticks on one side, and you have a lovely focal point to your room. Attach a long piece of garland about a foot over the top of a large mirror or painting hanging over your fireplace: Drape and attach the sides of the garland to surround the painting or mirror. Add a beautiful wreath at the top or an oversized bow to complete the picture. Weave garland in an out of casual chandelier arms. Swag the garland if you like. Add a beaded garland to give it sparkle or purchase crystal chandelier pendants and hang them from the garland. The light sparkles through them and adds a hint of shabby chic to the room. Weave and wind lush strands of garland in and around the tiers of your buffet table before you set out the food: Tuck sprigs of berries, ornaments, fruits or vegetables, or other decorative items into the greenery, or just leave it alone. It’s beautiful, plain and simple. Place a few pine bough branches around a tall pillar candle on a table runner: You now have an instant centerpiece. You can also use pine boughs as a decorative swag over doorways or on the edges of bookshelves.